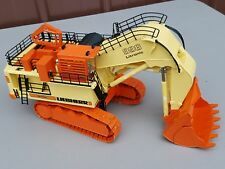 This is a large Conrad 1/50 scale diecast Liebherr 996 Hydraulic Mining Shovel. The railings on top of the boom will probably need to be glued on. A great looking shovel! CONRAD LIEBHERR R960 SCISSOR SHEARS WITH CHANGER 1:50 "BRAND NEW"
Use it for swapping out your bucket as there is a changer included. I have the sorting grab listed as well and only have limited quantities so pick one up now before you miss out. 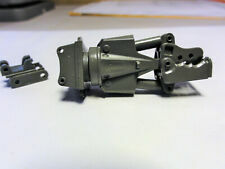 Use it for swapping out your bucket as there is a quick coupler includ. CONRAD 2950 LIEBHERR R9800 EXCAVATOR BUCKET 1:50 "BRAND NEW"
This monster is huge and you can compare its size to the truck and trailer in the pictures. Do not miss out on this as I only have a couple and they are hard to find. Only a limited few available to the market so get one now. Model # 4185, with box. This is a large 1/50 scale diecast Grove GMK6300 Hydraulic Truck Crane. The model was made in Germany by Conrad. The model is custom painted in "Ainscough" livery. A unique collector's item. Liebherr T264 Mining Dump Truck. "Fording Coal Limited" (custom painted). Mfg by:Conrad Serial #2765/0. 14 years of age. WINNER WILL RECEIVE ITEM(S) PICTURED. CONRAD 2948.06 LIEBHERR R922 EXCAVATOR "OETJEN" EXCLUSIVE 1:50 "NEW IN BOX"
Only a limited few available to the market so get one now. LAST ONE . A little about myself and my models: I am a 3rd generation collector of many construction models from all over the world. My grandfather, father, and myself have collected for many years. Model is new and box may show minimal storage wear. Long sold out I have found one in storage and present it to you for sale. Many people have been asking about it and now is your chance to get it. Superb Conrad 2094-45 Liebherr 1070-4.1 4-Axle Crane Grohmann 1/50 like-new no original box. Professional quality model which should be handled carefully, suitable for 027, O, or Super O layouts or high-end collector. LIEBHERR main jet landing gear. Mfg by:CONRAD. Models - Keystone Models Mfg - Norscot - Norev - NZG - OHS - Overland - Sherwood - Shinsei - Sword - Tonkin - Truck Miniatures - TWH - Warner & Swasey - WSI Collectibles. Liebherr 843 Dragline. Made By : Conrad. 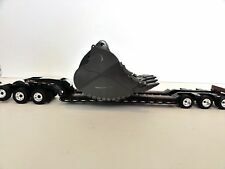 LIEBHERR CONRAD LIEBHERR T282 TIRES/RIM REAR replacement/trailer load 1:50 "NEW"
Limited availability and I have other sizes listed as well. You will receive the dual tires and rim pictured . Conrad Liebherr R 920 Compact Excavator "Black Edition"- 1:50 - "NEW RELEASE"
Beautiful model that has sold out at a record pace. Now is your chance to own one of your own for a good price. Limited availability! A little about myself and my models: I am a 3rd generation collector of many construction models from all over the world. This boom section fits the Liebherr 881 Crane Conrad #2831 - Extra Boom Section Plastic Pennant lines no box will also fit the 882 version. 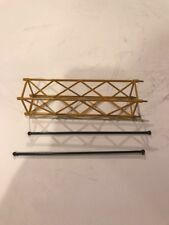 You are buying one boom section and two plastic pennant lines 1/50th scale. Looks good as is but wanted to be upfront. The box may show minimal signs of storage wear. Beautiful model from Conrad in the LIEBHERR series. Get it now while I have it because when it is gone it is gone. CONRAD LIEBHERR R954 SCISSOR SHEARS ATTACHMENT WITH CHANGER 1:50 "NEW"
Use it for swapping out your bucket as there is a changer included. I only have limited quantities so pick one up now before you miss out. A little about myself and my models: I am a 3rd generation collector of many construction models from all over the world. Liebherr T284 Mining Dump Truck. Mfg by:Conrad Serial #2766/1. Material: Diecast Scale: 1:50 Color: Yellow. 14 years of age. Condition: New. WINNER WILL RECEIVE ITEM(S) PICTURED. CONRAD LIEBHERR R954 or R960 SORTING GRAB WITH CHANGER 1:50 "BRAND NEW"
Use it for swapping out your bucket as there is a changer included. I have the demolition shear listed as well and only have limited quantities so pick one up now before you miss out. Use it for swapping out your bucket as there is a quick coupler includ. Removable catwalks with safety rails. Interior detail on both cabs. Rotating wheels. Counterweight assembly. Functional sheaves. Pivoting outriggers with removable pads. 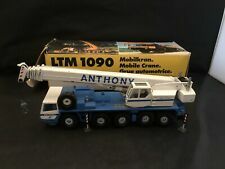 Conrad 2100 Scholl Liebherr LTM 1070 Mobile Crane 1:50 NEAT Hard to find! Made by Conrad. 1:50th Scale. Very Hard to find! The toy is used but looks new. Suitable for 027, O, or Super O layouts or high-end collector, museum quality. 1/50 scale marked clearly on original box (red/white diagonal stripes), highest quality associated with NZG models. The LR1280 crawler crane was the largest Liebherr crawler crane model when it first appeared at the end of 2002 and represented a step change increase in size from the previous largest Conrad model of this type, the Sennebogen Starlifter 5500. CONRAD LIEBHERR 9100 EXCAVATOR BUCKET REPLACEMENT/LOAD 1:50 "NEW"
Use it for swapping out your bucket, making that special project or as a load for your trailer. Limited quantities available and when there gone there gone! Super sharp looking and a real nice piece. Liebherr Conrad 2443/05 Liebherr L 576 Wheel Loader "HEITMANN-MINDEN" 1:50 "NEW"
Liebherr Conrad 2443/05 Liebherr L 576 Wheel Loader "HEITMANN-MINDEN" 1:50 "NEW". Very rare limited edition Liebherr L 576 Wheel Loader in the Heitmann-Minden livery made by Conrad. Very hard to find due to limited production run. Made by Conrad. Very Hard to find! Scale 1 50. Made in Germany. Do not know if this is compete due to no picture and instructions are not in English. Think possible there may be strings that are not in box. Liebherr Conrad 2907 Liebherr R954 BV Demolition Excavator w/Shears 1:50 "New"
Just taken from storage we have the Liebherr R954 BV from Conrad. Model is in new condition and the box has minimal storage wear. Stay tuned as I will have all the livery versions as well when I get to them. Liebherr T 264 Quarry Dump Truck. Mfg by:Conrad Item Number:2765/01. Models - Keystone Models Mfg - Norscot - Norev - NZG - OHS - Overland - Sherwood - Shinsei - Sword - Tonkin - Truck Miniatures - TWH - Warner & Swasey - WSI Collectibles. Liebherr 996 Shovel - White Version. Made By : Conrad. Condition: Near Mint In Box. 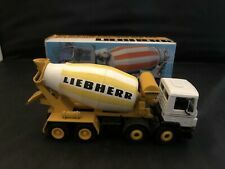 OEM: Liebherr. Part Number: 2833. Model: A 310 Wheel Backhoe. Manufacturer: Conrad. Scale: 1:50. Counterweight assembly. Interior detail on both cabs. Rotating wheels. Pivoting operator cab. Functional sheaves. Pivoting outriggers with removable pads. Heavy-duty classic model and excellent paint, many details including attachable side jib. Four wheel steering. Pivoting jib. Extendable multi-section boom. Pivoting operator’s cab. Conrad Liebherr 'Hydraulikbagger R 922. Liebherr 843 Crane. Made By : Conrad. Superb model and paint, museum quality model in sealed box identical to photos. Liebherr RL 22 B Litronic Pipe Layer. Mint condition in original box. Conrad Liebherr RL 22 B Litronic Pipe layer, Unknown scale, Smaller than 1/50th scale. Mine condition in original box. A must have for that die-cast Construction collector. Why collect models that are produced in the thousands when you can own rare ones such as this?. A little about myself and my models: I am a 3rd generation collector of many construction models from all over the world. Model is new and the box may show minimal storage wear. Now is your chance to get this as there are not many around. This is a real find as most collectors know. A little about myself and my models: I am a 3rd generation collector of many construction models from all over the world.